Sinabung volcano spews thick smoke and volcanic material in Indonesia's Karo district on September 15, 2013. Jakarta, Indonesia (CNN) -- A volcano in Indonesia prompted the evacuation of more than 6,000 people this weekend, blanketing buildings and cars in ashes, emergency officials said Monday. 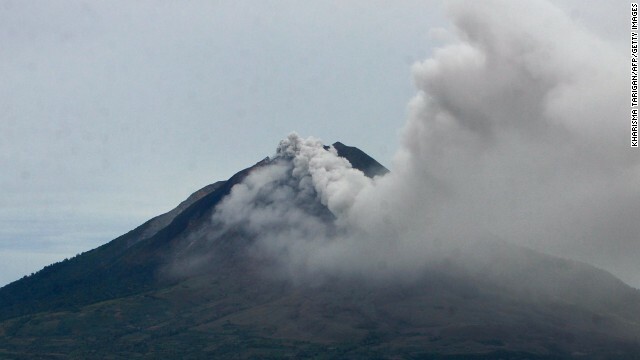 Mount Sinabung erupted early Sunday. It is the highest mountain in North Sumatra with an altitude of about 2,600 meters (8,530 feet). North Sumatra is a province on the Indonesian island of Sumatra. Five people suffered breathing difficulties after inhaling volcanic ashes, and they were transported to a hospital in the North Sumatran city of Kabanjahe, said Jhonson Tarigan, a spokesman of the Sinabung Disaster Control Agency. More than 6,200 evacuees sought shelter in eight locations, said Sutopo Purwo Nugroho, a spokesman for Indonesia's national disaster management agency. Officials distributed rice to the displaced people, local media reported. Nugroho said some of the evacuees returned to their homes during the day to tend to their farms and livestock and then returned to evacuation centers. There were a couple of eruptions in 2010. Kathy Quiano reported from Jakarta, Indonesia. Elizabeth Joseph reported from Hong Kong.